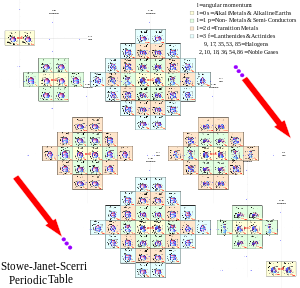 Since 1869, numerous table designs have been proposed to demonstrate the periodic law. This page provides links to a few alternate forms that appear on the web. Click on the icons below to see full-sized versions of the tables. From these tables, you may access information about an element by clicking on the element. This is the familiar condensed form of the periodic table (dynamic-check it out!) where the lanthanide and actinide elements are shown below the remainder of the table. In the long form, these f-elements are shown in the main body of the table. See an example of a triangular form of the periodic table. This example is based on the work of Emil Zmaczynski and graphically reflects the process of the construction of electronic shells of atoms. See an example of a spiral form of the periodic table. This example was devised by Theodor Benfey and depicts the elements as a seamless series with the main group elements radiating from the center with the d- and f-elements filling around loops. This is Timmothy Stowe's physicists periodic table. This table depicts periodicity in terms of quantum numbers. This is a 3-D periodic table constructed by Paul Giguere based primarily on the electronic structure of the atoms. The four main groups of elements are separated according to the type of atomic orbitals being filled. This is a periodic table constructed by Bruce Railsback that locates elements according their occurrence as ions in nature, rather than according to the configuration of their outer-shell electrons in their elemental states based primarily on the electronic structure of the atoms. Here is a pdf copy of the table that you might find useful. The evolution of the periodic table may need to occur to meet new discoveries. Cracks in the Periodic Table and The Many Looks of th Periodic Table pull together the old and the new. E.G. Mazurs has written a fairly comprehensive book outlining the different presentation forms of the periodic table that have been proposed (E.G. Mazurs, Graphical Representations of the Periodic System During One Hundred YearsAlabama:University of Alabama Press, 1974. J. Bouma, J. Chem. Ed., 66 741 (1989). An Application-Oriented Periodic Table of the Elements.